In an upcoming set of blog posts, I am going to talk about my nutrition strategy during training and racing. Possibly because it will help others but mostly because you’ll be able to say “that’s a terrible way to do it, here is why” and I’ll learn something new. I’m not going to cover the wider issue of diet and eating healthy. I love to cover that stuff on my blog, but this series is just looking at sport-specific stuff. To start with, I’m going to talk about hydration. One thing I picked up from the physiology textbooks is to drink as much as possible two hours before a race. That gives your body time to get all the liquid it needs and wee the rest out before the start of the race. Obviously, water is the main source of hydration. I don’t use anything special water because tap water is great. I fill all of my bidons the night before and chill them in the fridge overnight. I then drop a couple of ice cubes into them in the morning, just before I set off. 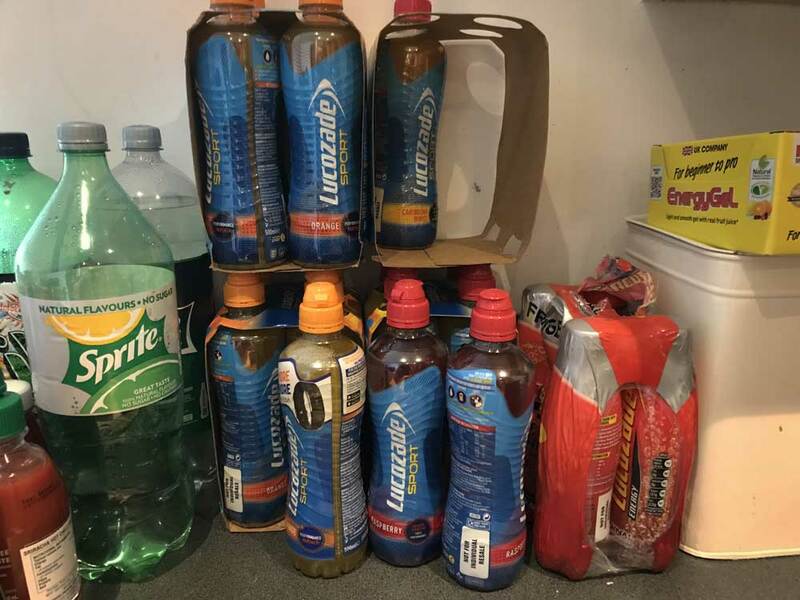 I drink a lot of Lucozade Sport. 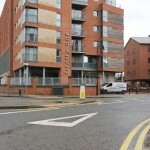 When I first started, I used Lucozade Energy. However, it’s fizzy, which isn’t as easy on the stomach. It does have the advantage of caffeine, but I get this from my energy gels. I fuel by numbers on the bike, so I’ll often drink every 5km to make sure I don’t forget. On the run, I am more laid back: drink when I feel like it, usually water. I don’t have to worry about it in the swim because of the amount of pool/lake/river water I drink. On race day I like to have a bottle of full-fat Coke to hand to get some sugar in me. After training, I will often have a recovery shake instead. These are great for giving you lots of protein. 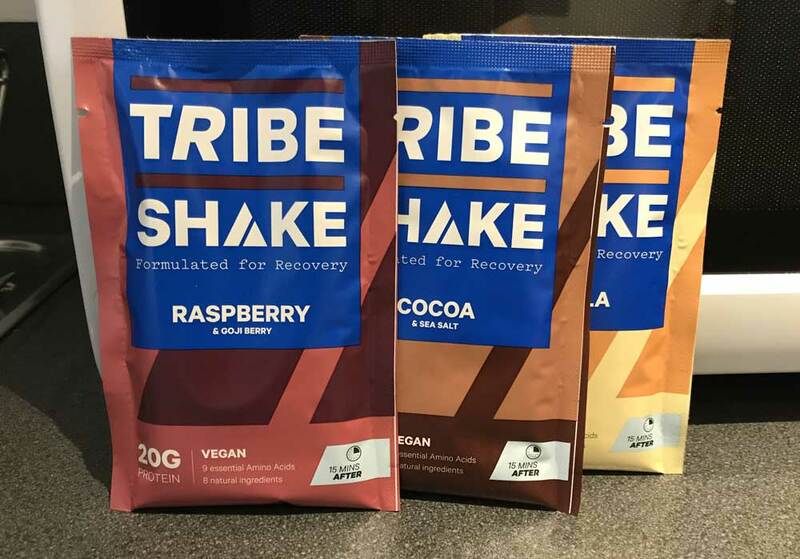 I use the Tribe shake mix, which I combine with milk though you can also use water. They’re a bit gritty even after a good shake but otherwise taste pretty good. Flavour preference, in order: raspberry, cocoa, vanilla. 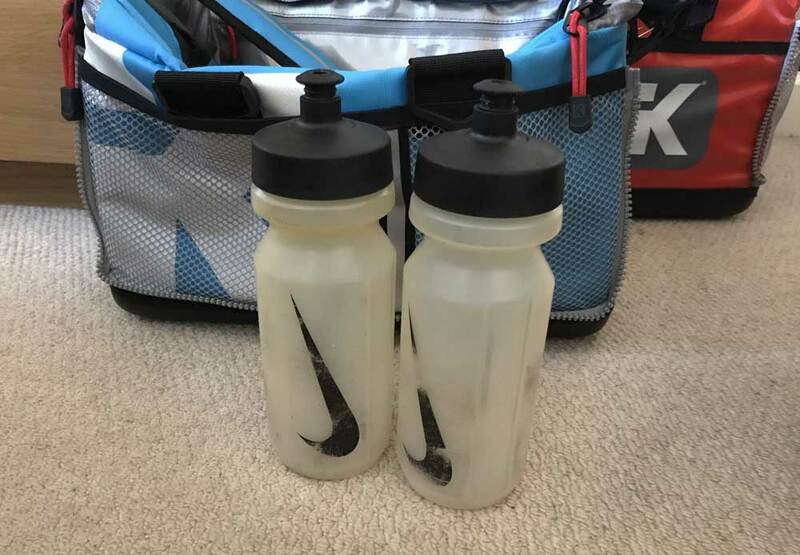 I use the clear Nike Big mouth bottles. They’re okay. I had some problem with leaking in my bag but I’ve since realised it was probably me not fully sealing the top and since then Ali haven’t had any problems. They are clear so you can see at a glance how much is left in them. I take two bottles mounted on the inside of the triangle in my bike (the usual places). When I’m running, I don’t take any bottles with me. This entry was posted on Saturday, June 2nd, 2018 at 11:00 am and is filed under Sport. You can follow any responses to this entry through the RSS 2.0 feed. Both comments and pings are currently closed.